The Assassin’s Creed series has had its share of expensive collectibles over the years, including replicas of the series’ famous hidden blade weapons as well as figures of its many playable heroes. This time, however, Ubisoft has put the pedal to the metal with a $500 limited edition statue for only the biggest Assassin’s Creed Origins fans. Available for pre-order and launching on March 15, the “Trial of the Gods” figurine is an extremely limited collectible, with only 100 made in total. It features busts of three Egyptian gods: God of the Dead Anubis, Warrior Goddess Sekhmet, and Lords of the Waters Sobek. All three have fine details all over their clothing and faces, including brass trim on Anubis’ chest. The figures are made of both brass and resin, are hand-painted, and come with a certificate of authenticity. Sekhmet and Sobek both have special headpieces behind them, as well. The former has a large red jewel above his head, while the latter features an oval-shaped piece of gold, almost like an egg. Along with the three figures, you’ll also receive a display base. It is engraved with hieroglyphs and the Assassin’s Creed symbol in the center, with each figure held up by two metal bars. If your budget is a little more modest, you might want to check out the other Assassin’s Creed collectibles Ubisoft has available. A bust of the original game’s hero, Altair, is available for $50, and figures of Maria and Aguilar from the recent film are also available. In the past, an Edward Kenway figure from Assassin’s Creed IV: Black Flag was also produced, and it’s possible that it’s sitting above one of our writers’ desks. Assassin’s Creed Origins managed to double the launch sales of the previous game in the series, Assassin’s Creed Syndicate. 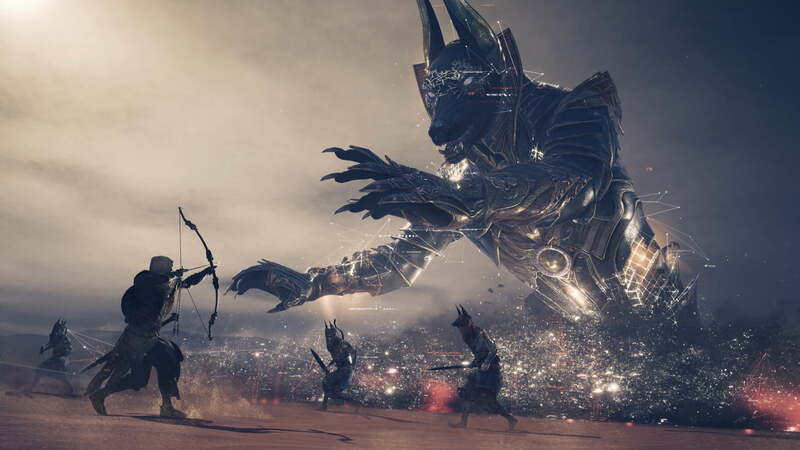 A new combat-free museum mode called “Discovery Tour by Assassin’s Creed: Ancient Egypt” is designed to teach players about key figures and locations in Ancient Egypt. It will be available for free to all Origins owners on February 20, and it will also be available as a $20 stand-alone game.